As human obesity rates rise, evidence suggests that pet obesity rates may be rising too. Obesity is one of the most common risk factors for diabetes in pets and humans. By some estimates, more than half of the cats and dogs in the U.S. are overweight, with probably just as many in Canada. 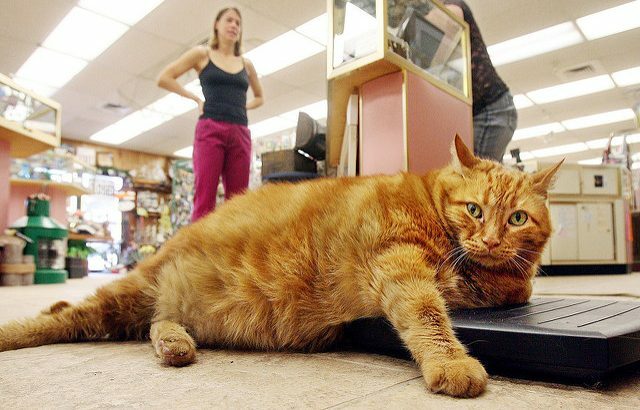 By some estimates, more than half of the cats and dogs in the U.S. are overweight, with probably just as many in Canada. November is Pet Diabetes Month and it might be time for Garfield and Jon to rethink the lasagna and consider a veterinarian-directed weight loss management plan, before Garfield needs insulin therapy. Preventing pet diabetes is a huge challenge. Overfeeding is a major culprit, according to the Canadian Pet Wellness Report. Many owners feed pets poor quality food, too much pet food, or too many table scraps. Proper nutrition and feeding practices were the most common recommendations made to cat and dog owners by Canadian veterinarians, according to that report. Pet foods rich in proteins are typically recommended to meet healthy diet needs, but specific food and portion size recommendations can depend on the size, breed, and life stage of your pet, as well as any other underlying health problems. On average, Canadian women spend more time engaging in active play with their pets than men, but pet owners still spend three times as much time watching TV and twice as much time surfing the net for pictures of grumpy cats, or dogs who have mastered the art of the pun, as we do playing with or exercising our pets. Scientists have argued that obesity in people and pets may be linked—a connection that bears closer examination. Studies have found an overweight owner is more likely to have an overweight dog. But that link hasn’t been made for cats. Similarly, low-income pet owners are more likely to be overweight and have overweight pets. There are lots of potential explanations for these coinciding trends. Low-nutrition, high energy foods are increasingly common in both human and pet diets. Overweight owners may be less likely to exercise with their pets. And maybe we have become too accepting of cute, pudgy pets. Orange cats like Garfield are most at risk for feline diabetes, followed by Burmese cats, and these risks are higher in male cats. Diabetes in dogs is more common in females, and in certain breeds including Australian Terriers and Swedish Elkhounds. Studies suggest that diabetes may occur in as many as 1 in 200 pet cats, and around 1 in 300 dogs, although the Canadian Veterinary Association estimates that it is diagnosed in around 1 in 500 cats or dogs. While we are focusing on cats and dogs, diabetes is not restricted to our most common four legged furry friends. Turtles, rats, and birds, and non-household animals such as cows, pigs, and horses also fall prey to the disease. Pets suffering from diabetes urinate often, are extra thirsty and hungry, and may lose weight suddenly. In rare cases, their hind legs may droop from weakness. 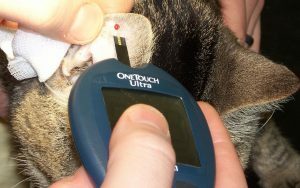 A veterinarian can test blood glucose levels, usually taken from your cat or dog’s ear flap, and confirm the results through urine analysis. Sometimes, the vet may ask cat owners to test their cats again at home, because in stressful environments like the vet’s office, their blood glucose levels can spike drastically. Dogs appear to only develop a type-1 diabetes like syndrome caused when the body doesn’t produce enough insulin, and cats tend to develop a type-2 diabetes like syndrome when the body’s cells become resistant to insulin. Recommended treatment for both types of diabetes typically involves monitoring blood glucose levels using glucometers, a regimented diet high in complex carbohydrates, and insulin injection therapy. Pets who are put on a strict diet and whose insulin is managed usually have very good results. Early diagnosis and careful management can even reverse insulin resistance in cats. Pets who are put on a strict diet and whose insulin is managed usually have very good results. To combat the burden of pet diabetes, veterinarians and owners should focus on prevention through healthy diet and active lifestyles, regular testing, and maintenance therapy in pets with a diabetic diagnosis. Health, Medicine, and Veterinary Science Ainslie Butler, cats, diabetes, dogs, Lindsay Jolivet, overweight, pets, veterinary science. permalink.